Not all threats come from outsiders. In an era of downsizing, layoffs, and pay cuts, sometimes it's your own disgruntled employees (or ex-employees) who are targeting you. Get some tips to help you protect your software from sabotage. Get the software engineering slant on items from the recent news. Turn to The Last Word, where software professionals who care about quality give you their opinions on hot topics. This month, read why perhaps software should come equipped with seat belts and an air bag. Need a place to go to get the solutions you've been craving? Management Fix is what you've been looking for. In this issue, find out how to manage when you suspect someone on your team may have been stealing from the company. We're pleased to bring you technical editors who are well respected in their fields. Get their take on everything that relates to the industry, technically speaking. 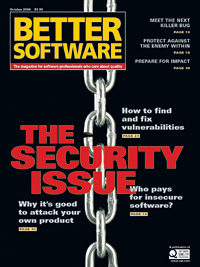 In this issue, find out why our guest editor thinks he's found the bug that will once again bring testers to the forefront—a bug that dwarfs Y2K and could put big, rich software companies out of business. Hackers are going to probe your system looking for weak spots and holes. What will they find? Learn how to uncover your own security vulnerabilities before the bad guys do. Vendors try to protect their source code from would-be attackers, but it takes only one chink in the armor for a good reverse engineer to penetrate all the defenses so carefully put in place. Find out how to methodically uncover patterns to help you predict where the attacks will be focused and how they will be carried out. For too long now, consumers have been bailing, patching, and plugging their software each time a new security hole is discovered. And they've been absorbing the damage done by the leaks. A wave of security-conscious buyers is rising, demanding software that is sound and secure by design. Are you ready to give it to them? Find out why you should be.